This is a fully-functioning pinball game with great graphics and great game play. The game includes a global scoreboard to which you can submit your high score (if you can get anywhere close – at the time of this posting, my high score is around 2.28 million, while the global high score is around 1.1 billion). This game is highly addictive and an amazing amount of fun, especially if you like pinball. As I already mentioned, this game is fully functional. There are other free pinball games available in the app store, but most of them either lack what this game lacks in graphics and game play, or they are sampler versions of paid apps. This one is completely free and completely enjoyable. This game does not include any ads, at all (at least, not that I’ve seen). 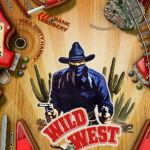 There is a “news” area on the global scoreboard that provides you with updates related to WildWest Pinball and its developers, but that’s the closest thing to an ad in the game. 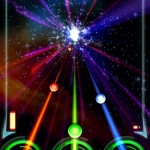 TapTap Revenge is an absolutely stunning game. For purposes of this article, I am referring to TTR 2.6, which includes a lot of features that weren’t available in the first TTR (which now sells for a minimal price in the App Store, but was also free when I got my iPhone). This is absolutely the best game available for the iPhone, and honestly rivals many of the games on other platforms. The game is inspired by Dance Dance Revolution (DDR) and resembles the Guitar Hero and Rock Band series of games. This game is a top-notch effort from Tapulous. I honestly am amazed that the game is available for free. There are no intrusive ads built into the game (at least, not yet). On each menu screen of the game, ads for the paid Tapulous apps (among a few other select apps, most notably Babelgum) appear at the bottom of the screen. There are also options that could be construed as ads when you perform certain actions, but they make sense. For instance, when you finish a song, you are generally given the option to purchase the song on iTunes. I don’t really consider that an ad, but some people might see it that way. The game play is truly fantastic. This game is easily worth at least $10 in iPhone standards, but is completely free. Instead, if you want the premium apps from Tapulous, which mostly include specially themed versions of TapTap Revenge (there’s a Coldplay version, a Weezer Christmas version, a Nine Inch Nails version, a Dave Matthews Band version and a Lady Gaga version, at the time of this writing), that’s when you have to pay. All of the songs in the premium versions are themed to look specifically the way the band would want them to look (photos of the bands, album artwork, special tapper symbols, etc.). In addition, some of the newer premium versions (Lady Gaga definitely, I’m not sure about the others) include a landscape mode that allows for four lines rather than the standard three. If you haven’t already installed TapTap Revenge 2, this is an absolute must. 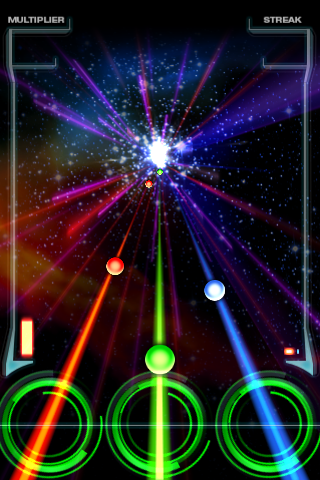 There are five different modes in which you can play; including Kids mode (tap anywhere and you get the points, it doesn’t matter if you hit the note or not), Easy (very few double notes, more space between the notes), Medium (a lot of double notes, but still a decent amount of space between notes), Hard (this is where it starts to get pretty insane) and Extreme (I have no idea how anyone plays these songs). In addition, the game is currently set up so that you can always finish the song, no matter how poorly you’re doing (as opposed to Guitar Hero and Rock Band, which both end the song if you start doing badly). This game is fun for everyone, and can be played with some proficiency at one level or another, no matter how coordinated you are. I decided to put these two together, as they both have very similar functionality, but each has a handful of pros and cons that outweigh each other. Which one you choose is purely a matter of personal preference. As their names suggest, these are both free clients you can use to connect to Twitter. 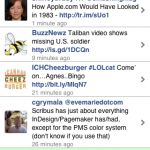 TwitterFon was the first one I tried, and I loved it. When I first installed TwitterFon, it didn’t include any ads at all. Later, they updated the app to include ads at the top of the screen. The current version has ads that “pop up” near the bottom of the screen when you leave the app alone for more than a fraction of a second. The TwitterFon developers have announced that they’ve realized how aggressive the new ads are, and that they are fixing it in the next version. TwitterFon gives you the option to auto-scroll to your first unread tweet, it highlights “mentions” within your timeline, and makes it very easy to see how many new tweets are in your timeline, how many DMs you have and how many mentions you’ve gotten since you last logged in. 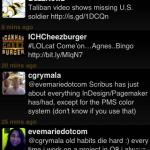 There is a “pro” version of TwitterFon that includes no ads, includes a landscape mode, allows you to add multiple Twitter accounts and more. 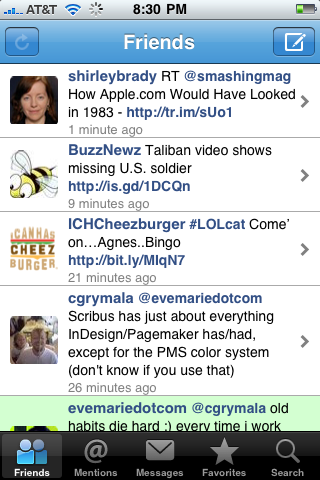 TweetDeck allows you to add columns for things like “Friends”, special Twitter searches and more. TweetDeck also allows you to monitor multiple Twitter accounts at once and allows you to keep track of your Facebook friends’ status updates. You can also sync all of your custom columns with the version of TweetDeck you have running on your computer. 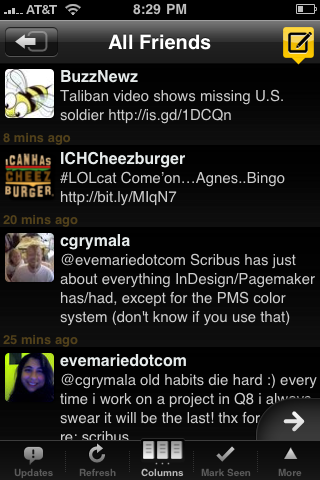 More about the PC version of TweetDeck can be found in my review and in my comparison to Seesmic Desktop. The iPhone version includes much of the same functionality. Just like the PC version, there are no ads in TweetDeck. This is another incredibly addictive game. This one is in the vein of popular games like Bejeweled. 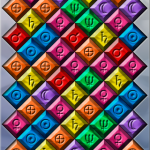 You are expected to match up three identical “gems” either in a row or in an “L” shape to make them disappear from the board. You are given a time limit for the game, which is extended with each match you make. 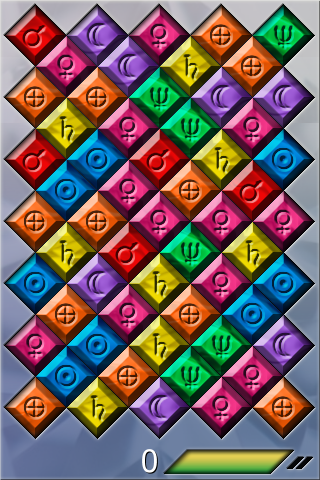 Shown in the screen shot is the “color blind” mode, which adds symbols to each of the “gems”. By default, only the different colors distinguish between the different gems. However, for someone who is color blind, the colors of the gems can be extremely similar, which makes the game infinitely more difficult. That’s why it’s really nice to see the color blind mode available in this game. This game is also completely free, with no ads built in. This is a really nice application that makes it easy and safe to transfer files back and forth between your computer and your iPhone. 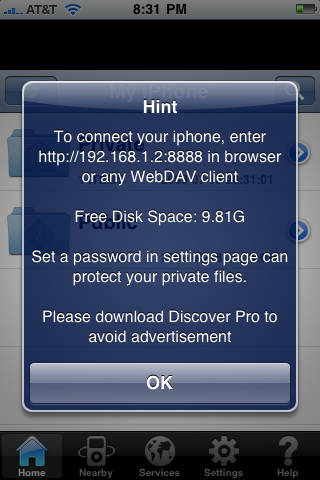 With WiFi Discover, you are given an IP address to type into your browser, which will automatically connect you to a file browser on your iPhone. Any files copied into the file browser on your computer are then transfered over your wifi connection to your iPhone. You can (and should) set a password that you have to enter when you open the file browser on your computer. This app is simple and fun to use. This app is ad-supported and there is a premium version available. This app is also available for Android phones (conceivably making it possible to transfer files from your iPhone to an Android phone and vice-versa). 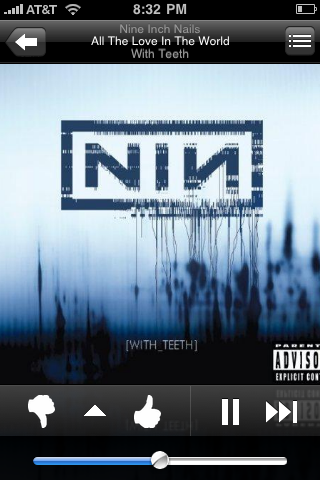 Pandora is the only major Internet radio application I’ve found that works the way I want. 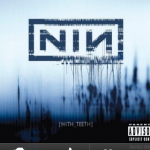 The app rarely buffers during a song and there is generally only a few second gap between tracks. You can easily create new stations on your iPhone, and the app automatically imports all of that stations you’ve already configured through the Web interface. This app is ad-supported, though the ads are much less obtrusive than they are in the Web client. Presumably, any listening you do on the iPhone app counts toward your allotted 40 hours each month (which is a new policy instituted by Pandora – in order to listen to more than 40 hours in a month, you will need to pay a $1 fee). Again, if you haven’t tried each of these apps, I would highly recommend installing all of them. There are certainly plenty of other great free apps available for the iPhone, but these (with the exception of the obvious ones I mentioned above) are the ones I use all the time. I hope you enjoy them as much as I do. If there are other free apps you couldn’t live without for your iPhone, please share them with me. Likewise, if you try any of these and want to share your thoughts, please do so. 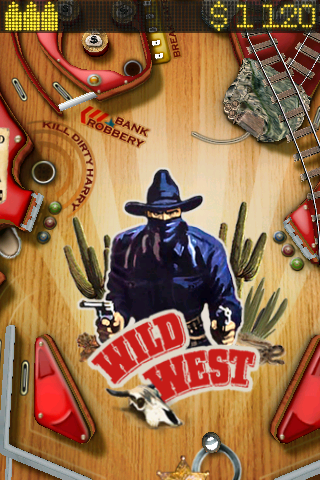 I love pinball and will definitely give the Wild West app a shot! bummer, just tired falling gems and tap tap revenge, both show .99 in itunes now.